Antonio Spilimbergo studied economics at the University Bocconi of Milan where he worked for a year. He received his Ph.D. in economics from M.I.T. in 1994. 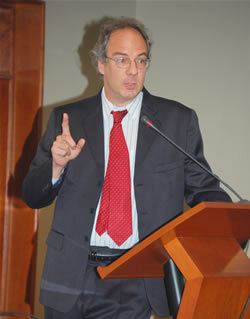 He worked at the Inter-American Development Bank between 1994 and 1997. Since July 1997, he has worked in the fiscal and research departments at the IMF. His areas of interest are: international trade, development, labor economics, and macroeconomics. His main publications are: “Illegal Immigration, Border Enforcement, and Relative Wages: Evidence from Apprehensions at the US-Mexico Border” (with G. Hanson) American Economic Review ; “Democracy and Foreign Education” American Economic Review ; “Business Cycle and Human Capital Investment: Country Evidence on University Student Flow to the U.S.” (with P. Sakellaris). Carnegie-Rochester Conference Series on Public Policy ; “Growth and Trade: the North Can Lose” Journal of Economic Growth. Antonio Spilimbergo joined CReAM as an external fellow in April 2009.